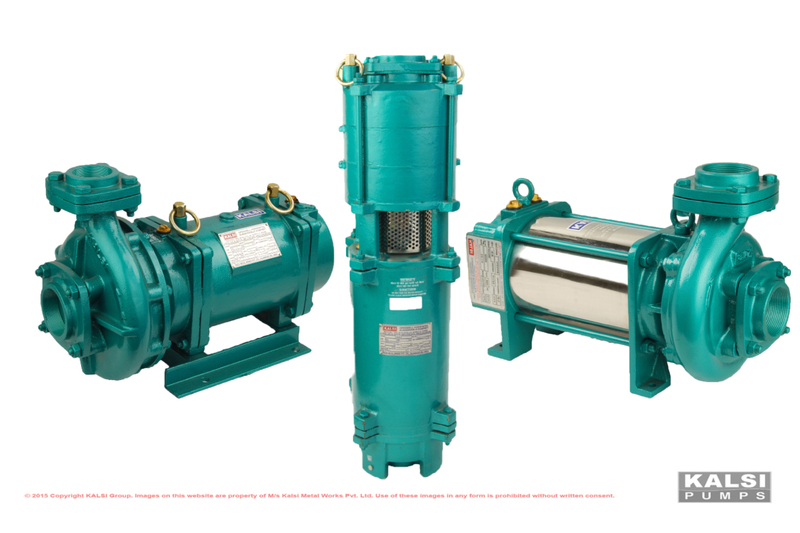 ‘KALSI’ Openwell Submersible Pumpsets are horizontal, single-stage energy efficiency Centrifugal Pumpsets ideally suitable for openwells or water tanks. 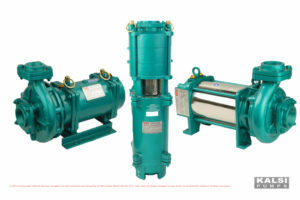 These pumpsets are used for pumping clean, clear cold water without solid particles or abrasives. These are manufactured under stringent quality control at all stages to ensure a trouble-free service. 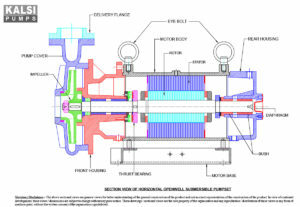 The pumpsets are ISI marked conforming to IS:14220 and are Star- labelled by the Bureau of Energy Efficiency (B.E.E.) ensuring energy saving. 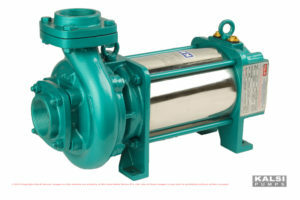 The pumpsets have water – filled, water-cooled continuous run motors.As the pumpsets are immersed in water at the bottom of water tank, hence there is no priming problem. Motors designed for operating under wide voltage variation. Sleeves and thrust bearings designed for longer life. FG 200 grade cast motors body having hydraulically pressed powder coated silicon laminated stampings. Powder coated rotors for corrosion resistance. Rotors and all rotating components are dynamically balanced for long bearing life and vibration-free running. After metallurgical testing, all components are manufactured on modern machines, including CNC machines for reliability and consistent quality. 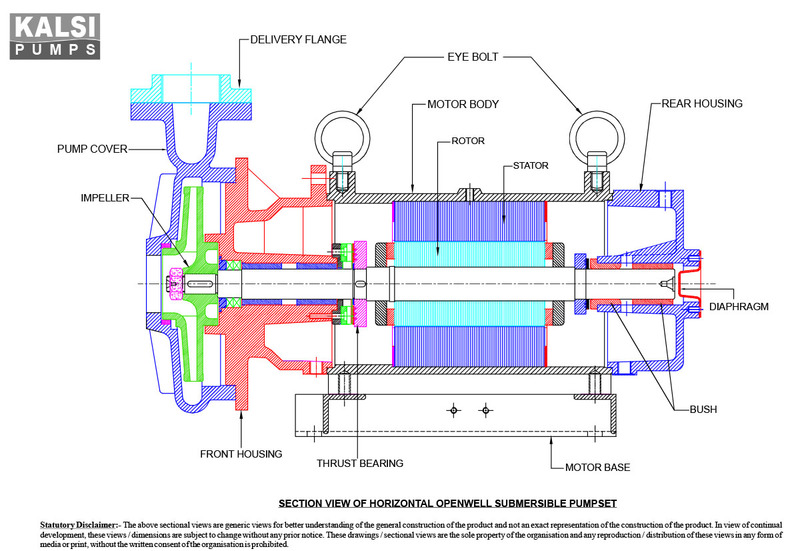 The openwell submersible monoblock can be placed at the bottom of the well. This arrangement does not require a suction pipe. Stator : Powder coated for corrosion resistance. To protect windings, thick end laminations are provided. Rotor : Powder coated, suitably baked for corrosion resistance under water, dynamically balanced for vibration-free smooth operation. Motor body : FG 200 grade C.I. Casting. Impeller : Cast iron as per FG 200 Grade of IS:210, Dynamically balanced. Shaft : Hard, annealed Stainless stell shaft of adequate diameter to ensure rigidity ground. Bearings : Leaded bronze / Nitrile Rubber water lubricated bushes, having high load bearing capacity. Thrust bearings : Special heat-treated segments are water lubricated to withstand high axial thrust load under adverse conditions. Breather : Optimum size to compensate the volumetric variation of water inside diaphragm the motor due to change in temperature. Suction casing : Cast iron as per FG 200 grade of IS:210. Casing Wear rings : High quality abrasion resistant Nitrial rubber. Cable Sealing : Cable glands, rubber seal and sand guard are provided to protect the arrangement motor, from ingress of borewell water and other foreign matter.